I ate a lot on day 5. I was hungry on the drive in so had an Atkins bar. I keep them in the car so that I don’t eat them in a serial fashion. This works great when I’m in work or home – I have to go out to the car for a bar – it requires a level of activity that’s reduces impulse. The risk is when I’m in the car, however – but this time there was no second-bar follow-up. When I got into work, I had my lunch, immediately – leftover pork chop and the rest of the mock potato salad. As this was a healthy amount of food, it actually lasted me the whole day – I actually forgot to eat lunch – another aspect of low carb that always amazes me. The evening meal was 2 more pork chops – this time I pan fried them in butter and oil, and used Wild Tymes Spicy Moroccan Dipping Sauce as a topping and had a large salad with Ken’s Ranch Dressing and some broken up pork rinds as crouton replacements, which I never tried before. 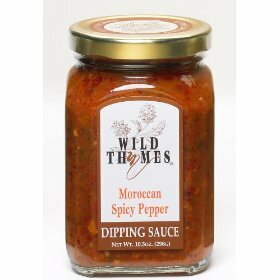 The piggy-skin crouton replacements were pretty darn good, and Wild Tymes makes a great line of exotic, but expensive, sauces. While I usually like my pork chops with a milder flavor, this was good. Forgot to check for ketosis, but I’ve eaten nothing to prevent it, so I assume I’m still in it. This morning’s weight: 205.6 – down 8.4 lbs. from the start. Wow dude the weight is dropping off big time. How do you check for ketosis? Here in the US you can go to the drug store and ask the pharmacist for Ketostix – they are used by diabetics to check for ketoacidosis. They’re about $10 for a bottle and you urinate on them – when they turn color, it means that your body is shedding ketones – and in ketosis. Thanks, this is fast becoming my favorite blog.